The Bichon Frise gets it's name from the Middle-French word meaning "small long-haired dog". 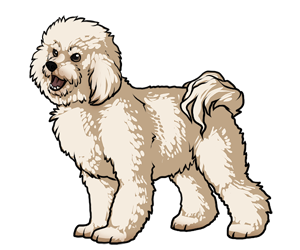 The bichon can be traced back as far as the 13th century and was likely developed from the Poodle and the Barbet Water Spaniel. The breed was used as companion and trading dogs by Spanish sailors who traded them all over the world. The Bichon became favorited in several pasrts of the world including the French royal court. Although used as performing dogs in the past, the bichon primarily served as a companion dog just as they do today. The Bichon arrived in the United States in 1955 and was recognized by the AKC in 1973. The Bichon is known for its love for water and retrieving. The Bichon Frise is recommended for allerigc owners as they do not shed as much as other dogs. However, strict grooming habits are needed to keep the hair they do shed under control.